Here's a guide for the newcomers of our community. 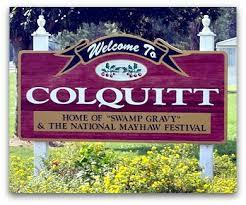 Colquitt was named for U.S. Congressman and Senator, Walter Terry Colquitt. It is the county seat and only incorporated municipality of Miller County, a role it has held since just after Miller County was created by the Georgia Legislature in 1856. The city formally incorporated on December 19, 1860. Miller County Hospital has been serving Colquitt, Georgia residents since 1957. This 25 bed, critical access not-for-profit hospital was named "The Hospital of the Year" in 2000 by HomeTown Health. The hospital offers a full range of inpatient and outpatient services to the residents of Colquitt and surrounding areas. The hospital accepts Medicare, Medicaid and all commercial insurances. Miller County Hospital is dedicated to delivering quality care for Southwest Georgia residents. This philosophy is upheld throughout the facility. "Where your family is our family." Miller Nursing Home was established in 1965. Our nursing home can accommodate 97 residents with 52 residential rooms; these rooms include private, semi-private and wards. We offer activities to all our residents 7 days a week. Miller Nursing Home has several beautiful places for the residents to spend time with family, friends or other residents. Our sun porch areas with hand painted murals on the walls, a large aquarium, a bird aviary and an outside courtyard with a large gazebo. We accept Medicare/Medicaid and Private Insurance. If you have any more questions about the services we render here at Miller County Hospital, please, contact us at 229.758.3385 or visit our website at www.millercountyhospital.com. By law, new residents are required to secure a Georgia license and auto tag within 30 days of moving to the state. Car tags may be purchased and ad valorem taxes paid at the Miller County Tax Commissioner's office in the Courthouse on the square. Driver's license exams are administered in Bainbridge, Georgia. You may register to vote at the Miller County Courthouse at 155 1st Street or at the James W. Merritt Library. You must be 18, a resident of Georgia, and registered at least 30 days before an election in order to vote. Phone (229) 758-4104 for information. Voter registration is also available in conjunction with the purchase of a Georgia driver's licence (MOTOR VOTER) through the Georgia State Patrol. Take your child's birth certificate, health exams, immunization and transcript records from your previous school with you to register at the neighbor school your child will be attending. For information on public schools, call the Miller County Board of Education at (229) 758-5592. To obtain information regarding post-secondary education, contact Bainbridge College Admissions Office at (229) 248-2500. Click here for current listings! Other land listings in Miller County and Colquitt, click here! For constant updates and menus, check out our FB page!